FLCC National races are streaming on replay. Click here. Ashley Brasovan from Florida is the 2007 Champ! Indiana's Michael Fout wins the Boys' Race! Connecticut, Delaware, Maine, Maryland, Massachusetts, New Hampshire, New Jersey, New York, Pennsylvania, Rhode Island, Vermont, Washington, D.C. and U.S. Overseas Military Installations. Alaska, Arizona, California, Hawaii, Idaho, Montana, Nevada, New Mexico, Oregon, Utah, Washington, Wyoming, and U.S. Overseas Military Installations. There is no qualifying time to enter the regional races. There is a race for everyone. 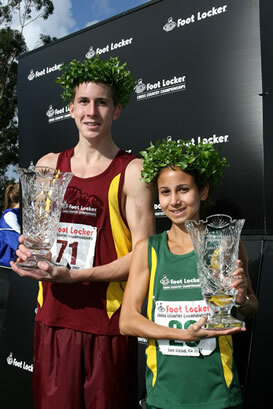 Foot Locker Alumni Hall and Ritzenhein qualify for U.S. Olympic Marathon. All-Americans (men and women) were FLCC finalists. Midwest Region announces All-Star lineup of Friday night speakers.